This book is also available through the Introductory Engineering Custom Publishing System. If you are interested in creating a course-pack that includes chapters from this book, you can get further information by calling 212-850-6272 or sending email inquiries to engineerjwiley.com. Good writing is brief and clear. This new edition of the popular handbook offers updated, practical advice on writing effective letters, reports, and memos, while retaining the easy-to-read format that made the first edition so popular. Presents examples of good writing to serve as models and also shows what to avoid. Includes illustrations (many more than in the 1st edition) of many types of good writing, culled from diverse sources. There is new material on writing minutes, news releases, resumes, and style guides. The section on writing reports has been thoroughly revised--every phase from initial organization to final selection of style has been updated to reflect modern practice. Suitable for classroom use or self-study. 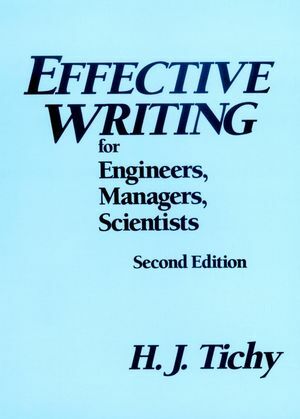 H. J. Tichy is the author of Effective Writing for Engineers, Managers, Scientists, 2nd Edition, published by Wiley. The Standards of Grammar for the Professions. Style: The Personality and Character of Writing. Brevity: The Soul of It. Advice on Some Short Forms. Advice on Some Long Forms. Appendix A: Fallacies to Forget. Appendix B: Problem Words and Phrases.